Honor and memorial gifts can be made on behalf of a loved one. These gifts are considered unrestricted and are used for the immediate needs of the school. Gifts can also be designated to support endowed scholarships or tuition aid. These gifts are considered restricted, and ensure the ongoing support of McQuaid Jesuit and its students. We have many named scholarships that individuals give to on an annual basis. For more than three decades our Knights’ Council has been a critical component of McQuaid Jesuit’s success. With more than 267 Knights’ Council members, our Annual Fund helps students realize their full potential as they are educated in the Jesuit tradition. Whether in the classroom, on the playing field, participating in a club, on retreat, or working on a service project, our young Knights are being inspired to learn, give back to their community, and to reach as high as they can. As part of our IgKnight the Future Campaign, our annual giving goal is to ensure McQuaid Jesuit continues to offer the best in Jesuit education by developing quality programming and supporting faculty and staff as they deliver it. 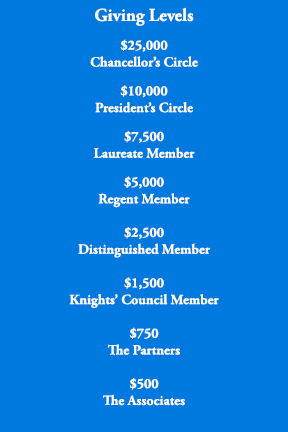 We invite you to be part of our Knights’ Council Legacy by pledging your Annual Fund gift of $1,500 or more over the next three to five years. Supporting the Annual Fund in this way will help secure the future of McQuaid Jesuit. Please contact Tim Nally, ’67 at (585) 256-6102 for more information.